I have personal memories of a few businesses on North Street when I was growing up and living in St Andrews Road in the 1950s/60s. I remember Norah’s a wool-shop and haberdashers; a visit to Norah’s could take some time as all the gossip changed hands there. The place was stacked high with ‘put away’ wool, hair nets, buttons, cottons, needles, stockings – all sorts of things and smelled heavily of mothacks. Norah was a jovial rosy faced lady with a tight perm who rode a black bike. I think the Sweet family lived next door to that shop; a lady and two small boys. I remember Whittaker’s sweet-shop – just. I also remember Goble’s the greengrocers, Pauline Goble went to school with me – she was a year younger than me. Then there was The Clarence Hotel – where I played with Sandra Luxton from time to time. Grace Hambleton’s father was Captain at the Salvation Army Citadel, but the Baptist Church was a recycling depot for paper and fabric when I was young. I used to get all my drawing paper from the paper and fabric warehouse, and my art materials from the little stationers on the corner of North Street and Station Road. I bought my first record player from a little junk shop just down the road from there. One summer, 1970 I think, I secured an interview for a job as a touch up artist at the photographers next to the pub at the Church Road end. I was taken into an office and a man with his back to the wall and me facing it, commenced the interview. He had just offered me the job, and before I could reply an enormous mouse scurried along the skirting board behind him. No way was I working in a place over run by super-mice. I was out of there at my earliest chance without telling the gent, so fast my feet could not carry me quickly enough. Do you remember any other shops? I think North Street must have been a grimy sort of place in its hey day. I would love to know more about it. My grandfather, who owned a fish shop in North Street died in 1946 and his wife in 1953; I never knew them and so never heard their memories of the area. Does anyone remember more about the shops? I feel they would have been gone by WWII. If you have any memories you can share, please do leave a comment below. North Street, Portslade brings back some memories. I worked for H. Baker & Co. as a lorry driver in the mid 60s. I had the country round which I loved as it was different everyday. We had to grease and oil our own vehicles on a maintenance day. As a nine year old I worked for Mr Cave who had the chip shop next to Tooks ironmongers in North St four mornings a week. 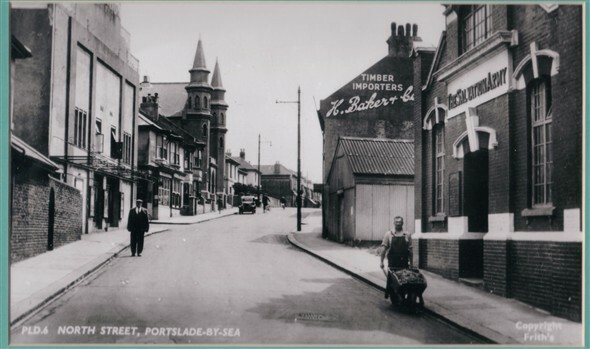 I had to go to Portslade station with a sack trolley which was taller than me and collect three crates of fish packed in ice from Grimsby. Each crate was heavier than me all- for 2/6 a week. I asked for a rise of 6d a week and got the sack. I walked up North Street today and compared it to what it looked like in the old days. Today it is a dump. Does anyone know of or remember a junk shop at Upper Rock Gardens, near the junction of Edward Street, and even better its name? It features in an old ghost story in several books on Sussex hauntings. Would be curious to know where it was. The shop was apparently there in the 1950s, and 60 years, or thereabouts, earlier a murder occurred in the basement kitchen. Does anybody remember the potato crisp maker in North St, between Middle St and Nora’s wool shop?